The Cherokee Indians, though not citizens of the United States nor of the recently formed Confederacy, supported both the Northern and Southern governments and served in both the Union and Confederate militaries, which resulted in warring factions within the Cherokee. The Cherokee were involved predominately in the eastern and western theaters and fought bravely in many of the major battles of the Civil War. The Oconaluftee Indians (Eastern Cherokee) would form the last Confederate unit to surrender East of the Mississippi, and Cherokee chief and Brig. Gen. Stand Watie, who attained the highest rank among the Cherokee, commanded the final Confederate command, consisting of men of the Cherokee Nation, to surrender West of the Mississippi and of the four year Civil War. 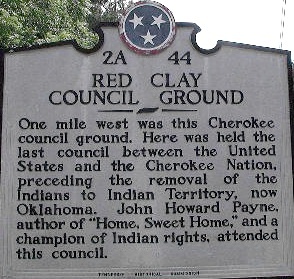 While this page offers a rich history, interesting details, fascinating facts, with plenty of pictures and maps, for Cherokee Indians and the American Civil War, it includes the Cherokee Nation Declaration and the Civil War, leading Native Americans during the conflict, and the Five Civilized Tribes and the great divide of Civil War. It also covers Cherokee chiefs and other famous American Indians and their support and involvement for the Confederate and Union armies, as well as Cherokee Indians and their struggle to assimilate into the Union during Reconstruction. (About) The following caption appears under the original image: Above is shown the last photograph ever taken of the remaining members of the famous Thomas Legion, composed of Cherokee Indians in the Confederate Army. The photograph was made in New Orleans at the time of the New Orleans Reunion of Confederate Veterans. 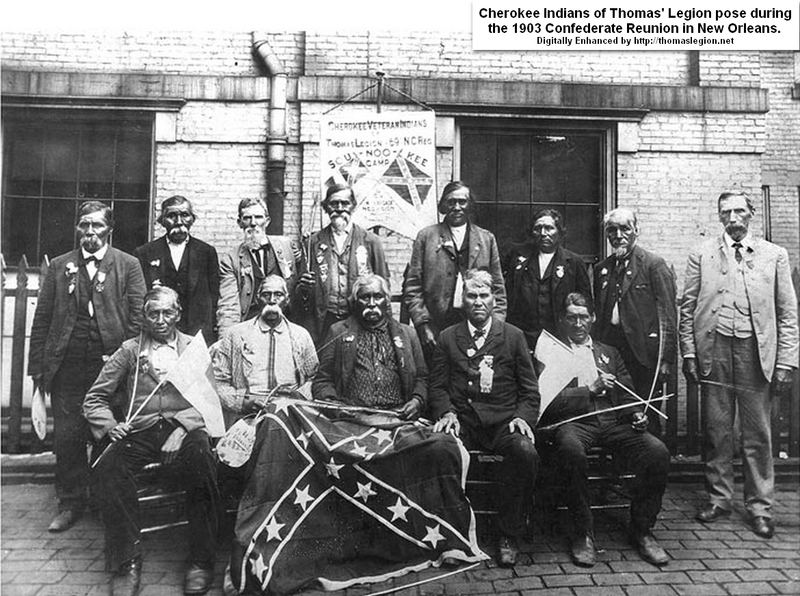 The inscription on the banner, displayed in the photograph, is as follows: "Cherokee Veteran Indians of Thomas Legion. 69 N. C. Regiment. Suo-Noo-Kee Camp U. C. V. 4th Brigade, N. C. Division." Reading from left to right, those in the picture are: front row, 1 Young Deer; 2 unidentified; 3 Pheasant; 4 Chief David Reed; 5 Sevier Skitty; back row, 1 the Rev. Bird Saloneta; 2 Dickey Driver; 3 Lieut. Col. W. W. Stringfield of Waynesville; 4 Lieutenant Suatie Owl; 5 Jim Keg; 6 Wesley Crow; 7 unidentified; 8 Lieutenant Calvin Cagle. All of these men are now dead with the exception of Sevier Skitty, who lives one mile from Cherokee. Lieut. Col. Stringfield and Lieut. Cagle were white officers of the legion. Names of the men in the photograph were furnished by James R. Thomas of Waynesville, son of the late Col. W. H. Thomas, who commanded the Thomas Legion. This band of Indians built the first road across the Great Smoky Mountains.